A video training series to help you form an even tighter bond with your furry friend with training techniques that can be done in just five minutes a day. 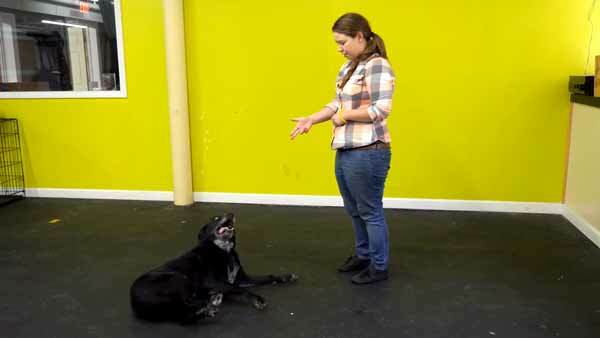 This trick is just one of many you and your dog will learn together in this video training series! You Get Instant Access to These Six Tricks for $19.99! Your dog is a superhero! Teach your dog to Roll Over! You stand stationary with your feet apart and your dog weaves in a figure-8 pattern around your feet. 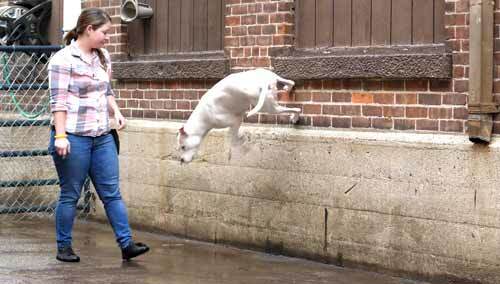 Your dog will do a “handstand” against a wall, with their back paws against the wall. Most other trick training I’d looked into involved travel to expensive seminars or requires the dog to have a special aptitude already. I like what Britt has done here, she really set me up for success and thought of all the “gotchas” that have prevented me from getting started in the past. She also demonstrated all the techniques on a “green” dog, so I know what to look for when training my dog, who started out only knowing how to sit. Dogs are incredibly intelligent creatures and trick training challenges their mind, like a brisk walk or playing fetch challenges their body. 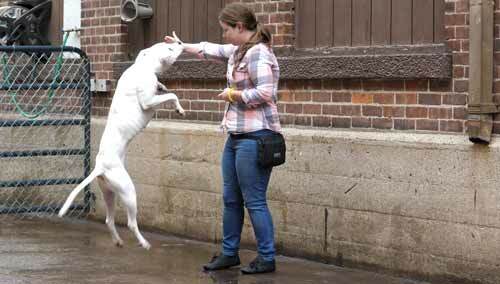 Trick training is one of the best ways to increase the connection between dog and owner. This video series and training community will show you how. 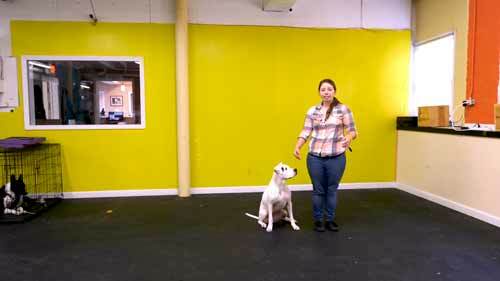 All training is demonstrated with a dog who knows only basic obedience commands and then with a trained dog. This way, you can see just how fast you will be able to progress, even if you’ve never trained tricks before. We realize not everyone has access to a training arena, so we broke the training down to its simplest elements. The only equipment required are treats and three-dollar clicker. 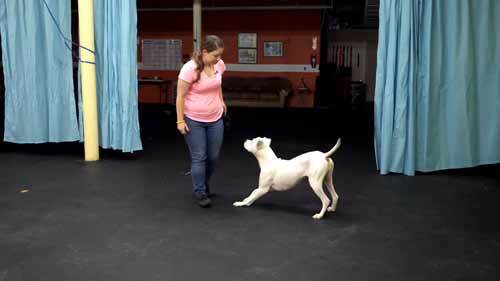 Trick training is a mental workout for your dog. It can tire them out the same way a long walk or game of fetch can. When your dog is learning new tricks, a five-minute session will often result in a calmer, more relaxed dog. What Makes This Trick Training So Different? 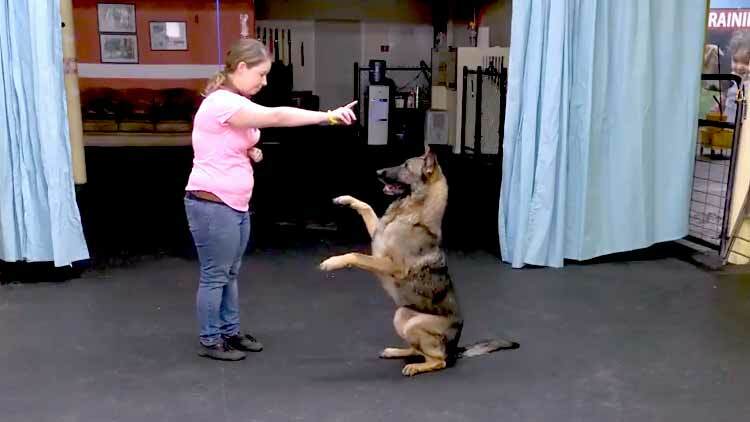 This training is focused on deepening the connection you share with your dog via trick training. 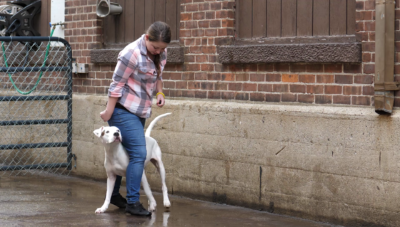 This training is designed to help you get inside your dogs head and understand how they are motivated… and how they think and then using that knowledge as a way to sort of “reverse engineer” the trick you want your dog to perform. The easy-to-learn techniques you are about to discover will enable you to master a set of six tricks. What’s more, you will also be able to start designing your own tricks using the very same techniques. Before we go any further, let’s talk a bit about why a technique that builds a connection with your dog is much better than just having the dog “memorize” a trick. The problem of an over-energized dog doesn’t go away on its own, and you might not have the time (or the inclination) to play another round of fetch in the rain. From my own experience, I knew that trick training was very mentally taxing on the dogs I trained. They loved every minute of it, but often times, they would calm after only a few minutes of trick training vs more fetch. What’s more, they would be focused on me the whole time, vs hunting around for the next squirrel to chase. Trick training seemed to be the holy grail in terms of forming a connection between dog and owner while dissipating excess energy at the same time. The only problem was my clients thought it was too hard. Many of them were happy simply having a dog that would “sit” on command, and they didn’t think they “had what it takes” to train their dog past that without investing many hours each week or hiring an expensive trainer. I knew that many of the disobedience issues they were experiencing with their dogs were related to excess energy, and I knew that my clients and their dogs would benefit from trick training, even if only for a few minutes a day. It requires hours of practice to see results. 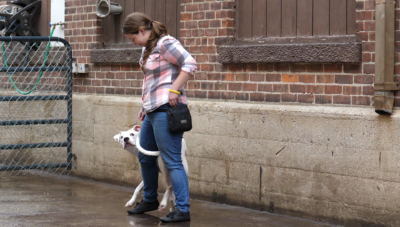 The training I developed is designed to quickly build connection and confidence in both you and your dog, in almost any space you can think of (I’ve even had a client say they tried it during a long ride in an empty elevator.) The best part is that you can begin to see results within one five-minute session. Here I am with my two rescue dogs, Spot on the left and Angus on the right. I adopted Angus when he was 11 and taught him his first tricks, he is now 13 and still loves to play and do tricks. Angus is proof that you can, in fact teach an old dog new tricks. Spot was a high-energy rescue who loves to work and be challenged. 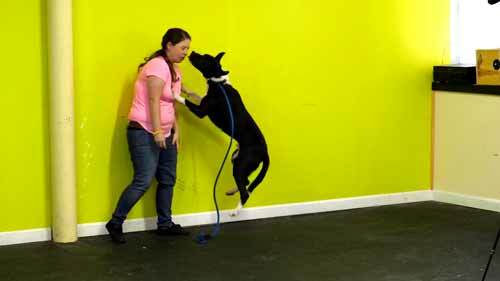 If these dogs can learn tricks, yours can too. p.s. I’ve put together some great bonuses that will make getting started EVEN EASIER. Scroll to the bottom of the page to see what they are. I designed this training series to make my friends and clients successful in connecting with their dog via trick training. Normally, you would get access to four tricks with your purchase and then have the opportunity to double your order to 8 tricks for a low price. During the launch, you get access to the main offer and the “double your value” offer at an amazing price (remember to use your coupon and to click the “double my order” box at checkout). Make the decision to create an even deeper connection with your dog! Click the buy now button and get access to the videos and other resources. Instant access, even if it’s 2AM! Your access details are sent to your email address. Simply log in and get started! Your dog will love you and you’ll discover one of the best-kept secrets to connecting with your dog. Earlier this year, Brittney had helped me adopt my handsome Boxer Beau. I was really excited to have him as my running buddy. Though he would play with our other dogs and go for walks during the day, he would still have so much energy left to burn after our nightly run! So, I decided to contact Brittney in the hopes that she could recommend a more strenuous exercise for Beau and I. That is when she recommended Trick Training. My first though was; “How could this burn energy? Teaching him to roll over is great, but I want him to be tired before bed”. I signed up for trick training with Brittney for something to do with my dog, Zorro. What I got was that and so much more! Brittney has that “special something”. She showed a passion for teaching along with endless patience. I gained confidence, a sense of accomplishment, problem-solving skills, and a better relationship with my dog. It was amazing watching Zorro put the pieces together and learn the tricks so quickly. Most tricks were easy to learn. However One in particular “The bow” proved to be difficult for us and I would have been happy to quit and move to the next trick. Brittney encouraged me to stay the course and keep at it and sure enough, we were successful! Brittney Souza makes trick training fun and effortless! With her step by step instruction, it is very easy to follow along. When teaching my dog, Remo, handstand, he wouldn’t even walk backwards! Breaking down the steps into simple goals, made it all seem too simple but it worked and now he’s a pro. 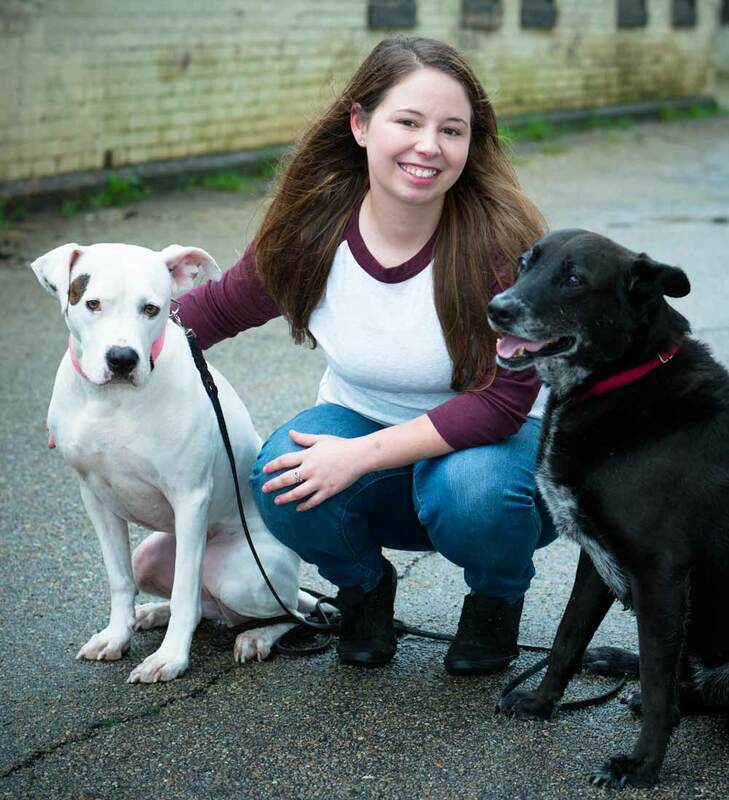 Brittney gives you all the proper tools to work at your own and your dog’s pace. Instant Access, even if it is 2AM! Payment instructions: Enter your details below, your payment will be securely processed by PayPal and you’ll be automatically logged in to your Membership Dashboard where you can access your trick training courses! 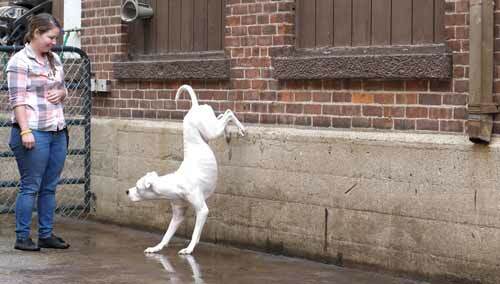 Your dog will do a “handstand" against a wall, with their back paws against the wall.